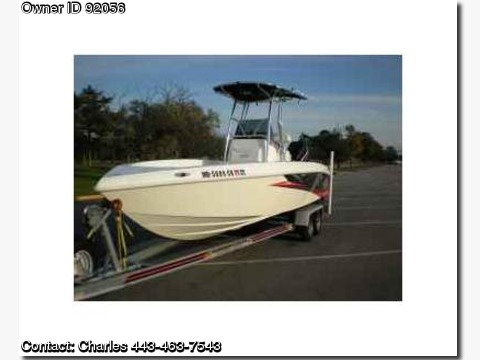 Call Boat Owner Charles 443-463-7543 or email crj1985@verizon.net. 2005 Spectre 24 Center Console, Good to go, fast fishing boat with nice, like new trailer. Mechanical Equipment: Engine Alarms (Incl. ); Engine Cylinders (6 Cylinders); Engine Location (Outbord); Fuel Tank (86 Galons); Steering (Hydraulic); Trim Tabs (Incl.). Electrical System: Alternator (Incl. ); Battery (2); Horn (Incl. ); Night Lighting (Incl. ); Ship's Power (12v DC) (Incl. ); Stereo (Incl.). Deck And Hull Equipment: Anchor (With 150' Of Rope); Beverage Holders (Incl. ); Boathook (Incl. ); Cockpit Lighting (Incl. ); Cockpit Seating (Incl. ); Custom Cover (Incl. ); Fenders (Incl. ); Fish Boxes (Incl. ); Mooring Lines (Incl. ); Pop-up Cleats (Incl. ); Rocket Launchers (4 Plus 6 In Rails. ); Snap-on Cushions (Incl. ); Sun Awning (Incl. ); Swim Ladder (Incl. ); Swim Platform (Incl. ); Tackle Storage (Incl. ); T-top (Incl. ); Leaning Post (Incl. ); Alarm (Incl. ); Bilge Pump (1); Fire Extinguisher (Incl. ); First Aid Kit (Incl. ); Flare Kit (Incl. ); Life Jackets (4); MOB System (Incl.). Electrical Systems: Alternator (Incl. ); Battery (2); Horn (Incl. ); Night Lighting (Incl. ); Ship's Power (12v DC) (Incl. ); Stereo (Incl.). Electronics And Navigation: CD Player (Incl. ); Compass (Incl. ); Fish Finder (Incl. ); GPS (Incl. ); Knotmeter (Incl. ); Navigation Lights (Incl. ); Sound System (Incl. ); Speed Instrument (Incl. ); VHF (Incl. ).